As Route 66 emerged as a national east-west artery, thousands of mom-and-pop businesses sprang up in the dusty lots lining the highway. 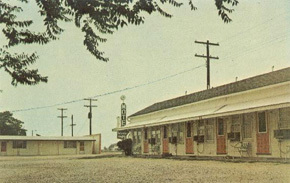 The Mom and Pop of the Belvidere Motel and Café were Albina and Vincenzo Cerolla, European immigrants who bought roadside property in Litchfield shortly after Route 66 received its designation as a national highway. In 1929, the Cerollas built a one-room, frame gas station with a single pump, offering oil, grease and fan belts for travelers on Route 66. By 1936,the Cerollas had expanded their tiny gas station into a one-stop, multi-service, roadside complex. Vincenzo and Albina built a new brick gas station, a café, four motel rooms with individual automobile garages, and a small house for themselves and their two children. Now travelers could gas up their cars with help from Vincenzo (called James by then), sleep the night in the motel, and get up in the morning to sample Albina’s breakfast biscuits. In the café, the Cerollas splurged on a streamlined Art Deco interior--black lacquer counters trimmed in chrome, padded chrome barstools, and handsome Deco cabinets behind the counter. Here the Cerollas built a thriving trade, assisted in the business by their daughter Edith and, after she married, her husband Lester “Curly” Kranich. 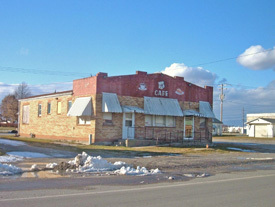 During the 1940s and 1950s, the Belvidere Café was an especially popular stop along the highway. As one resident recalled, “The Belvidere was the Cheers of its time. You know, where everybody knows your name and they’re always glad you came.” Edith became known for her roast beef, pork, and outstanding fried chicken. The Belvidere had a small dance floor, a juke box, and the occasional small combo. But most of all, the Belvidere had Mary Levy. Considered a treasure at the Belvidere, Mary played the piano and sang. No customer was a stranger to Mary. Locals and Route 66 travelers alike felt welcome at the lively Belvidere. By 1950, Vincenzo and Albina had passed away, leaving the business to Edith and Lester. Their two children recall that, in the tradition of family-run enterprises, Edith and Lester “did everything.” Lester primarily ran the gas station while Edith managed operations of the café, which at one time had a revolving sign in front promoting Chicken in a Basket. Following his retirement, Lester Kranich recalled, “Oh, it was busy in those days. When 66 still went by, you met people–you talked to them. This was the best place in town to eat and I’m not bragging." The hard work of the Kranichs proved successful. They built a new home on the property and expanded the motel, just in time to take advantage of the increase in Route 66 traffic following World War II. The 1950s and even the 1960s were good to the Belvidere, but the following decade was not. The Belvidere was successful because it looked out on America’s Highway. When use of Route 66 waned, so did the fortunes of the Belvidere. The Belvidere Café, Motel, and Gas Station closed soon after the completion of Interstate 55 west of Litchfield in the 1970s. Today the buildings are used primarily for storage, although some still serve as motel rooms, but they are well worth a stop as you travel Route 66. While many motels, cafes, and gas stations have been documented along the historic highway, the Belvidere is one of the best preserved complexes of its type. It was listed in the National Register of Historic Places in 2007, and is a classic example of a family-run roadside enterprise that for two generations and three decades served as a gathering place, a respite, and a memorable stop along the way. The Belvidere Café, Motel, and Gas Station is located at 817 Old Route 66 in Litchfield, IL. Much of the complex is out of use, but motel rooms are rented nightly for approximately $29 and are accessible to wheelchairs. Call 217-324-4411 for more information. The National Register nomination form for the building can be found here .